In Pekin, Illinois, ethanol producer Aventine Renewable Energy operates a 110 million gallon per year wet mill and a 57 million gallon per year dry mill. The wet mill facility, which was originally built in 1899 as a sugar processing plant, began producing ethanol in 1981 and since then it has undergone numerous upgrades. The latest upgrade to the Pekin facility, which was completed in May just this year, involved the installation of an automated truck weighing and traffic flow system – SmartTruck – from CompuWeigh. 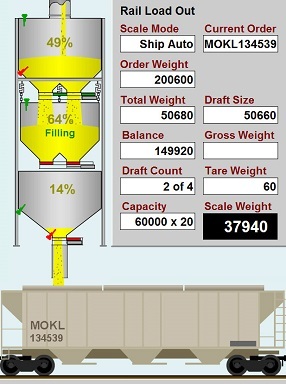 The aim of this technology is to automate the entire process of truck receiving and load- out, managing traffic flow and eliminating the need for staff other than at the first point of contact – typically the probe station in an ethanol plant grain receiving application. The SmartTruck system comprises various modules and components to ensure that each project is tailor-made to the customer’s needs. It utilises a combination of long range RF cards, outside message boards, electronic photo eyes, video surveillance cameras, IP based intercom systems, electronic signature pads, driver’s license readers. The Pekin plant handles 38.5 million bushels of corn a year and SmartTruck will help Aventine efficiently process the vast number of trucks bringing feedstock to the site. While SmartTruck can be configured for a completely unmanned receiving operation, Ciucci says that a fully unmanned receiving transaction is not desired for ethanol plants. Instead, Aventine uses CompuWeigh’s SmartTruck system in a partially manned operation, which is most commonly used in grain receiving applications because it allows the plant to retain control of transaction information (producer, splits, etc.) prior to being sent to accounting. 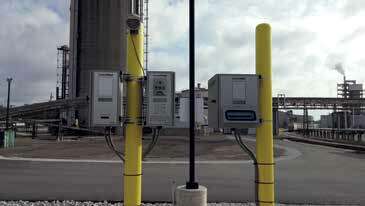 The plant does use the system in an unmanned state for by- product load-out transactions. This works well because these transactions are simpler in nature with a single load order number being entered by the driver for each load which is validated against the accounting system at the time of processing. SmartCom allows drivers to enter load-order numbers. SmartTalk from CompuWeigh provides clear audio and video communication between drivers and staff. 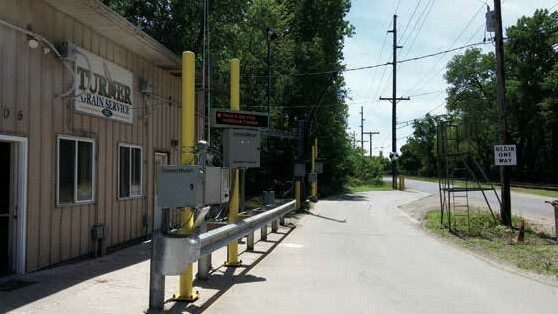 Before entering the ethanol production plant, trucks first check in down the road from the facility, at Turner Grain (certified grading service), for the probing process. A radio frequency identification (RFID) card is read and the truck is scanned and probed for a grain sample. The driver uses a CompuWeigh SmartCom outdoor alpha-numeric keypad to input a Load-order Number. If needed, the driver can use Compuweigh’s SmartTalk technology to communicate to staff inside the grade office without having to go inside. SmartTalk is a remote communication system that provides clear audio and video communication between drivers and staff. The noise cancellation device filters out the majority of truck background noise so both parties can hear each other very clearly. This is a key part to the system because it reduces errors while collecting transaction data from the driver. The truck then proceeds to what Aventine calls ‘grade verification’ – a location with a SmartTruck pole installed. The truck then pulls up to the location and is automatically identified by the RF card. The ID of the truck and grade details are automatically displayed on the SmartView. SmartTruck will then verify whether or not the driver has passing grade and then, using Compweigh’s Gate Control option, open a gate to allow the driver to enter the plant. This allows Aventine to secure its facility as only trucks that have acceptable grades can enter the plant. The truck then pulls onto the inbound scale and is automatically identified by the RF card. The ID of the truck and vendor details are automatically tied to this RF card from the probing process, therefore no human intervention is required. Photo eyes confirm that the truck is correctly positioned on the scale, the gross weight is displayed on the SmartView message board and a still image of the truck is recorded with the transaction history for security reasons. Once a green light is illuminated on the message board, the driver pulls off the scale and proceeds to the dump pit area. After the driver empties the load into the correct pit, he or she proceeds to the outbound scale, where the RF card is scanned again and the truck ID is displayed on the message board. Photo eyes confirm the truck is positioned correctly on the scale, an image is taken and the net weight is computed, stored and displayed on the SmartView message board. Finally, a CompuWeigh OTP-4600 printer prints out a scale ticket with final weight and grade. If the driver wants a second scale ticket for ‘hauler records’ they simply press the ‘re-print’ button on the OTP-4600 printer. 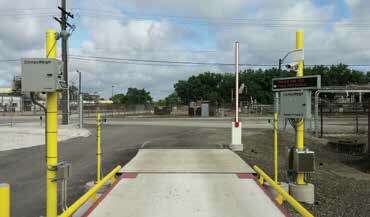 In addition to CompuWeigh’s SmartTruck technology, SmartFlow is also operational at Aventine’s Pekin plant, enabling data collection from flow meters loading ethanol onto trucks, rail cars and barges. SmartTruck is helping Aventine Renewable Energy process more trucks in less time, saving time and money. The average return on investment is less than two years. This is achieved by processing more trucks in less time, reducing overhead costs and waiting time, clearly displaying transaction information on SmartView message boards and improving traffic flow by directing trucks to the correct dump pit. The technology also eliminates human errors by automating data entry, keeping drivers in their trucks and eliminating office disruptions.